Julie Lessman continues the Daughters of Boston series, focusing on Charity O'Connor. The beauty is desperate for love and marriage, but her methods bring only heartache. It takes the love and forgiveness of the people she's wounded to finally bring Charity the desires of her heart. It took awhile for Charity to grow on me. As Julie revealed her backstory, I found myself caring and wanting her to grow into a woman of quality. At times she horrified me, but I also saw the hurt little girl wanting the love of those around her. While a strong romance, the story promotes God's values in all relationships. Forgiveness, accountability, and God's love run like a golden thread through this book. Julie's series holds great promise. I look forward to a long reading relationship with the O'Connor clan. It's so funny how characters are subjective. Charity amused me. But maybe I started out with a soft spot for her because I've had friends like her. Characters are like regular people when they're done well. It's a tribute to Julie that she can evoke both negative and positive emotions in the reader. It means her characters are true to life. How each of us react to a character depends on our own personalities, experiences, etc. I think she did a great job with the story. 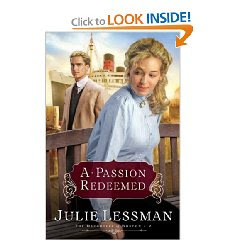 The title says it all, "A Passion Redeemed." Susan, thank you SO much for your wonderful review! And your statement that "It's a tribute to Julie that she can evoke both negative and positive emotions in the reader ... How each of us react to a character depends on our own personalities, experiences, etc." really blessed me because I've never really thought about that before. There is a wide range of diversity in readers' reactions to this Scarlett O'Hara-type character, and since I just LOVE Charity, I never understood why others didn't, especially by end of book. Thanks for your insight! 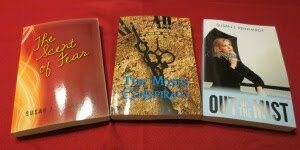 You're getting me really excited about reading Julie's series! Sounds great! I'm glad! I started book 3, A Passion Denied, a couple of days ago. Beth is the heroine of this volume.